I’m trying to understand better when (and how) to use Facebook, FriendFeed, Delicious, Yammer or Twitter (I also blog and wiki, but these I know when and how). I’m introducing my students into Twitter, after having introduced them into CiteULike, Delicious; before we go into FriendFeed and GoogleReader. (I’m sorry I’ve given up Twine and Gnoss for the moment; interesting but not fluent). FileSocial, a very effective and safe way for sharing files (I’ve shared a MP3) of up to 50MB. Seesmic, the best web tool I found to monitor users, lists of users and hashtags. TwitR, a directory of users classified according to their favourite hashtags. Very convenient if you are looking to expand your contacts and lists with users with whom you share interests. (Barb Dybwad, @Mashable, suggests 12 more interesting things to do with Twitter). Twittshpere. All these elements are structured and neatly related. The amount of informatin is huge (3 million messages a day, more than 1 million users in March 2008). It conforms an open, rapidly expanding and meaningful sphere of data, i.e. it is fresh food for linked data. Linked Data. Tim Berners Lee et alii define linked data as a method of exposing, sharing, and connecting data via dereferenceable URIs on the Web. I’m particularly fond of open datasets. Linking Open Data (source Wikipedia): A project to extend the Web with a data commons by publishing various open datasets as RDF on the Web and by setting RDF links between data items from different data sources. In October 2007, datasets consisted of over two billion RDF triples, which were interlinked by over two million RDF links. By May 2009 this had grown to 4.2 billion RDF triples, interlinked by around 142 million RDF links. GeoNames provides RDF descriptions of more than 6,500,000 geographical features worldwide. 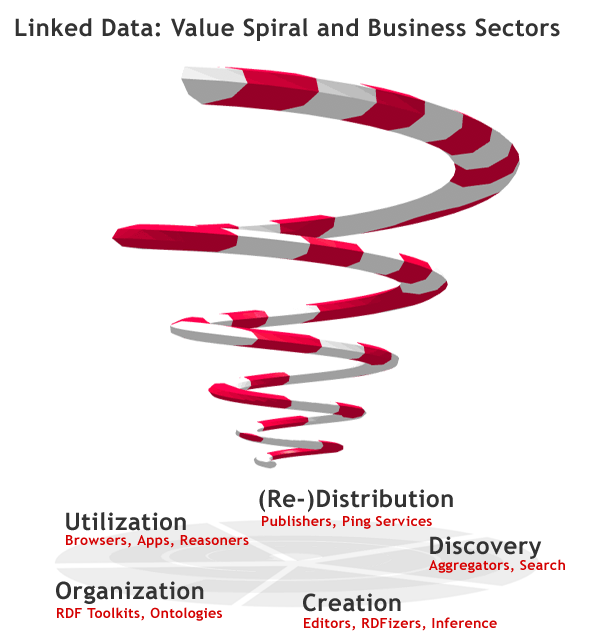 Revyu – a Review service consumes and publishes Linked Data, primarily from DBpedia. Who will be first adding to this list open data from the Twittshpere? You bet! This entry was posted in Classroom, Technology, Web, Wikipedia and tagged CiteULike, DBpedia, Delicious, Facebook, FileSocial, FriendFied, Gnoss, GoogleReader, Linked Data, Natouring, Seesmic, Tim Berners Lee, Transket, Twine, TwitR, Twitter, web3.0 on November 8, 2009 by Joseba Abaitua. Ahora que veo que mencionas Twine y que le has dedicado algo de tiempo, me surge una pregunta sobre esta plataforma: ¿qué ventajas aporta sobre delicious? Tengo cuenta en Twine, pero la verdad es que no le presto atención. Cuando empecé a oír hablar de Twine, me hice la cuenta y empecé a trastear un poco con la idea de que si me convencía dejaría atrás delicious. Sin embargo, al poco tiempo, me desencanté y seguí usando delicious. No sabría explicarlo, pero Twine no acababa de convencerme y no le veía grandes cambios con respecto a delicious. Gracias Guillermo por el comentario. Respecto a Twine… mucho ruido y pocas nueces. Estuve trasteando una temporada, pero lo he abandonado. No le he visto nada que no me aportara Delicious y por contra es mucho más abigarrado. Pretende explotar la parte social de las folcsonomías, por un lado, por otro presume de incorporar tecnología semántica. A ninguna de las dos facetas le he visto ventajas o posibilidades que no tenga ya Delicious. Así que hemos llegado a la misma conclusión.